“Set your focus on the end goal"
Oil Search has an excellent track record of mitigating production decline through infield and near field drilling, field rejuvenation, incremental workovers and optimised reservoir and facilities management. Achieving this in a low oil price world and while operating in one of the world’s most challenging environment means pulling together the best team of subsurface engineers and geoscientists available to support highly skilled field production, maintenance and world class drilling teams. This diverse team of engineers and geoscientists have been the architects behind Oil Search’s PNG oil and gas production and working amongst them is Serah Wakia Joseph. From the Enga Province, Serah remembers growing up in the 90s watching her uncle who worked for Oil Search, fly back and forth from work. “I remember as a child looking at Oil Search’s Annual Reports with its images of the Central Processing Facility (CPF) and imagining how amazing it must be to fly back and forth from work in such a place. And who would have thought that 20 years down the line I’d have the opportunity to work in that very facility as a Petroleum Engineer,” says Serah who has now gone on to become Production Engineer for Oil Search’s corporate office in Sydney. “Earlier on I was intrigued by how an aircraft managed to stay airborne. I was later challenged and motivated by the fact that there were not many women in Engineering at that time. I wanted to make my mark in this male dominated space so I chose to take up science. “Broadly my current role is to provide Production Surveillance and Operational Support particularly to the CPF,” says Serah who was involved in the execution of Oil Search’s ongoing flare minimisation strategy at the CPF in 2012. Serah has been with Oil Search for six years and has accomplished a few other milestones in that short period. “My first degree was in Mechanical Engineering from the University of Technology. In 2012, I commenced my Graduate Development Program with Oil Search and there my interest in Petroleum Engineering was ignited. With the support of the Company, I did my Post Graduate Diploma in Petroleum Engineering through the University of New South Wales and upon completion of my Postgraduate Diploma in 2015, I was offered a space in the University’s Masters Programme, which took me 18 months to complete. 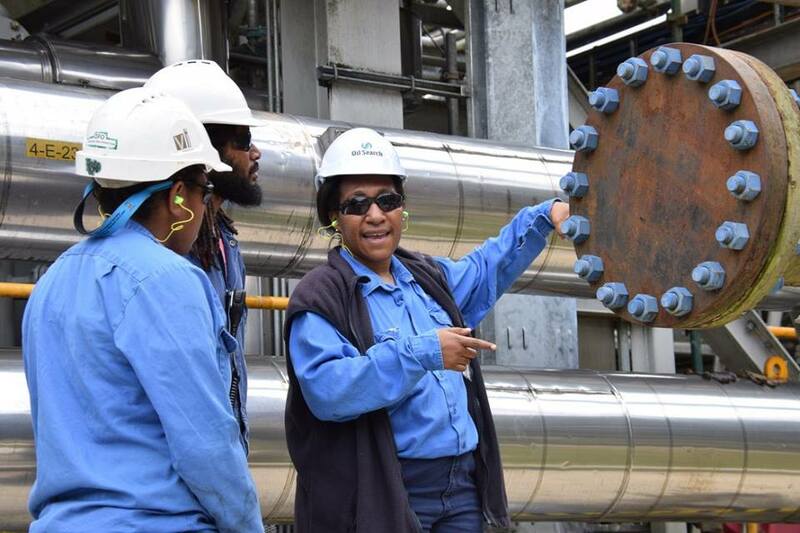 “I am thankful to Oil Search for such wonderful opportunities and as one of the very few Papua New Guinean women to take up petroleum engineering, I am humbled and honoured to serve my country and Oil Search in this capacity,” said Serah.